As is always the case, it’s the poor who are bearing the brunt of the catastrophe. In what is now officially one of the worst tornado disasters in US history, dozens of people have been reported dead in Oklahoma—many of them children—with the toll expected to rise as the search for survivors in the rubble continues. 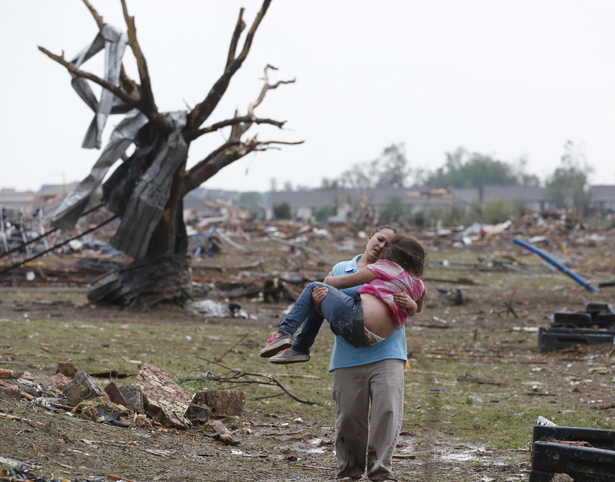 Television showed shocking destruction spread over a large area, with block upon block of homes and businesses, many in and around the Oklahoma City suburb of Moore, completely demolished. As is always the case, it’s the poor who are bearing the brunt of the catastrophe: because sub-standard housing is much more vulnerable to natural disaster, because support networks are likely to be far more impoverished and because whatever small cushions people possess are quickly wiped out in the face of disaster on this scale. Here are some Oklahoma groups on the ground doing relief on behalf of the state’s most impoverished residents. They desperately needed our help before this storm was even glimpsed, but now more than ever, support is critically needed. I'll keep updating this list so use the comments field below for suggestions and check back later. The Oklahoma Regional Food Bank was established in 1980, and has grown into the largest non-faith-based hunger-relief organization in the state of Oklahoma. It already had its hands full trying to feed the estimated 675,000 Oklahomans not getting enough to eat; now it has established special outposts near Oklahoma City to provide immediate food to those rendered homeless by the tornado. Occupy Norman is acting as a clearinghouse for information about indie relief efforts and coordinating housing and medical supplies for those urgently in need. Team Rubicon’s Operation: Starting Gun is mobilizing volunteers to go directly to the communities to help assess damages and expedite home repair. Your support will help get these volunteers where they need to be as quickly as possible. Set up through the non-profit, grassroots-supporting Global Giving, the Oklahoma Tornado Relief Fund is raising dollars for both immediate needs, as well as long-term rebuilding goals. The Red Cross has set up shelters in various, affected communities. Donate to the Red Cross Disaster Relief fund; the organization also suggests giving blood at your local hospital or blood bank. If you’re searching for a missing relative, check the Red Cross Safe & Well site.